In 1946, William H. and Edward A. Hobart had a vision. Their vision was a vastly expanded recreational program for the City of Troy. This expansion would involve an 18-hole golf course, a new football stadium and a winter sports arena. They proposed that if the citizens of Troy passed a $450,000 bond issue to build the golf course and stadium, the C.C. Hobart Foundation would build and give to the City of Troy a winter sports facility. Troy City Council accepted and approved the plan. At a special election in 1947, the citizens overwhelmingly approved the plan. The new municipal golf course opened in April, 1947, and the stadium in September that same year. On September 6, 1950, the vision became a reality with the opening of Hobart Sports Arena. Since then many charitable, religious, civic, and educational groups have benefited from using the facility. Over the years, some of the best known entertainers in the world have performed at the Arena. It has hosted all types of sporting events, trade shows, conferences, concerts, etc. The events and activities have generated millions of dollars for the Greater Troy area. 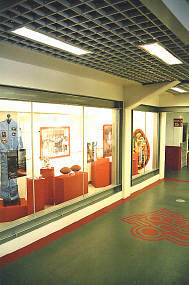 In 1995, Lucia Bravo visited Hobart Arena and noticed several areas that needed to be upgraded. After discussing this with her husband, Robert, the Bravos had a vision of giving more than one million dollars to be used as seed money for the renovating of Hobart Arena. They felt by committing such an amount, that the citizens of Troy, other groups and organizations would also donate towards the upgrading of the facility. In 1996, Troy City Council and the Recreation Board approved the project and a renovation committee was formed. The architectural firm of Lorenz and Williams of Dayton, Ohio, was hired, and a complete assessment of the facility’s needs were made and prioritized. The goal of the Bravos, the arena’s Renovation Committee, and the architects was to bring Hobart Arena up to modern day standards, equivalent to the day it was opened. In April of 1997, the first project began. The scope of the renovation project included the following: the arena’s roof and exterior areas were repaired, windows were replaced, exterior lighting was upgraded and new landscaping was added; the main entrance and lobby were upgraded; in the corridor, a rubberized floor was installed, walls were revamped and a ceiling added; the concession stands were relocated to make room for the constructions of the Troy Hall of Fame in the hall entrance; the restrooms and locker rooms were renovated; the arena’s ceiling was painted; the ice surface was enlarged and new seating was installed; the acoustics were evaluated and baffles and a new sound system were installed. Troy City Council paid for and installed a new electrical system and air-conditioning system. In 2015 Troy City Council continued its commitment to Hobart Arena by approving a $9.6M Renovation and Expansion Project that began in February of 2016 and was completed in May, 2017. Over the last 10 years, the wide variety of events taking place in the building increased significantly. This renovation and expansion project intended to address the various areas of the building that continued to present challenges for the building when hosting events. The primary focus was the improvement of pedestrian traffic flow by creating more space in the corridors, adding concessions stands and restroom facilities. In addition, a second lobby was added to the south end of the building closest to the main parking lot. 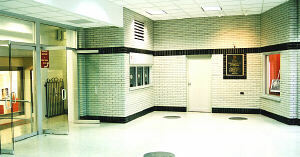 The west lobby remains and is now ADA accessible. All of the dressing rooms were moved “back of house”. All of the maintenance and storage areas were consolidated and moved “back of house” also for increased efficiencies. A multipurpose room, The Bravo Room, was added to better accommodate arena events and to also provide a banquet space available for rent.